The Poem Farm: F is for FELT & Laura Purdie Salas! F is for FELT & Laura Purdie Salas! Happy Poetry Friday, and welcome to Day #6 of my April Dictionary Hike! This month, I am walking, letter-by-letter, through the dictionary, (closed-eyed) pointing to a letter each day, and writing from it. You can read poems A-E by checking the sidebar, and you can read Lisa's accompanying haiku at her blog, Lisa's Poem of the Week. It has been a daily surprise to see where my finger and mind land! Students - Today's poem is a free verse poem. When I pointed to FELT, I immediately thought of the felt map of Nevada that I sewed in third grade. It really was made from lime green felt with yarns of yellow, blue, and red. I don't remember if I thought about a child from Nevada as I sewed, but I like to think that I did. It's a great thing to write story poems; you can give them endings that you love. Working on this poem took me back to a year and a half ago when I wrote about another state project - Wyoming. Today I am not really here! Well, I'm here...but I'm somewhere else too. As you may know, Renée LaTulippe is hosting a series of poetry videos over at her blog, No Water River. Today I am grateful to be visiting Renée, reading a poem about (gasp!) a naked sheep. You can see that video and read about sheep and more here. Thank you so much to Renée, for having me. And welcome to readers from No Water River who may be visiting here. And as I visit No Water River, it is an honor to host Laura Purdie Salas here! With many many books under her belt, today Laura shares a sneak peek behind-the-scenes of her latest poetry collection, BOOKSPEAK! : Poems About Books. Welcome to Laura as explores one poem from this wonderful collection with us. This poem didn't appear in my first draft of BookSpeak!, which kind of amazes me because it might be my favorite poem in the collection. I think it's because it reflects my growing understanding of what goes into creating a book. When I was a kid, I read all the time. But I never gave a thought to who made the book. As I got a little older, I realized books were written by real people (surprise!). So until I was probably 20 or so, I thought the writer was the only important person in the book-making process. It wasn't until I started working as freelance writer and as an editor that I began to realize how many people go into creating a book. Sure, the writer and the illustrator are the most visible. But without lots of other people, like editors and designers and buyers, books would not be as wonderful as they are. And they wouldn't get into readers' hands nearly as well. Once I hit on the idea of this kind of ode to people who make the magic of books happen, I ran with it. Earlier drafts included literary agents and the Library of Congress and other people. But it was getting too long, and my editor was getting antsy. And poetry is all about capturing the essence of a subject, to me. So even though I sadly left some stanzas out, I do hope this poem remains a love poem to ALL the people who help a book travel from the writer's mind all the way to the reader's heart. I have to confess that I still like that ending better, talking directly to the reader. But my editor disagreed. And since my editor is usually right, I went with that! Students - I think you could write wonderful poems using "This is the Book" as a model. Try this. Pick a process, like a seed growing into a plant. Then think about all of the different things that are needed to make that happen, like seed, soil, sun, etc. Start with a stanza describing the seed. Then give each item its own stanza where you capture what its most important contribution is. Don't worry about rhyming. Just pick the strongest, most wonderful words you can. Then end with the plant, the result of everyone's else's efforts. You could do this with so many things. Maybe you want to write a poem in tribute to your peanut butter sandwich! You could applaud the farmers who grow the wheat for the bread. And the peanut plant. And the grocery store stock boy. And your dad for making the sandwich. The possibilities are endless! You could also just take an item with multiple parts, like a house, and give a stanza to each part. Instead of celebrating a process, you'd be simply celebrating each individual part of something -- parts that maybe don't usually get much attention. So, you could write about your house, and you could have a stanza about the front door, the bathroom, the roof, etc. You could be factual or silly or beautiful -- whatever kind of writing mood you're in. For instance, let's take the roof. There's no right or wrong answer -- it's poetry! And it's you. Have fun with it! Much gratitude to Laura for joining us here today at The Poem Farm on this beautiful second Friday of National Poetry Month! You can read more about Laura at her website, her blog - Writing The World for Kids, or peek into her notebooks at my other blog, Sharing Our Notebooks. And you can hear her reading This is the Book over at Katie Davis's site! Laura's publisher, Clarion Books, has generously donated a copy of BOOKSPEAK! to a reader of this post. Please leave a comment on this post anytime through Monday night (11:59pm), and your name will be entered into a drawing for this delightful book. Congratulations to Charles Waters for winning the four Janet Wong books this week! Thank you to Janet for donating them (and the new set you sent too!) Charles, please just send me an e-mail with your snail mail address, and I will get those out to you as soon as we return from holiday next week. Everybody - if you have not yet seen Janet's humorous and wise process piece, check out my other blog - Sharing Our Notebooks. Today's Poetry Friday roundup is at Read, Write, Howl with Robyn Hood Black! Stop by and stuff yourself with words. And don't forget Thursday, April 26 - Poem in Your Pocket Day! How will you celebrate? I loved BOOKSPEAK when we read it for the CYBILS, and it was fun to hear the background behind one of the poems. I would love to own a copy of this book! how it felt to hold my hand? 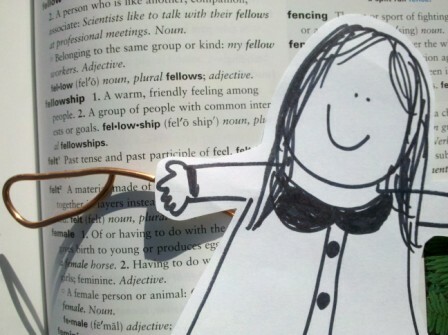 Happy Friday and thank you for putting my name in the drawing for Bookspeak! Lisa! I adore adore adore this haiku. I am thinking of kindergarten, of little children holding hands on the playground. Thank you again for being my wordfriend. Happy Poetry Friday! a.
I LOVE your idea of the dictionary hike and finding a word to use in a poem like MM Poetry. And I also am grateful to read more about Laura's BookSpeak. Can't wait to read it myself. As a newbie to the kidslitosphere I am delighted to be spending a good chunk of my morning flitting around the blogs and having so much fun while learning so much. Thank you!! Bookspeak spoke to my heart. It made me think of so many ideas. Thank you, Amy, for hosting Laura today! Laura, at the risk of sounding "stalkerish" you saved my poetry tail yesterday with the 15 word challenge. Now today, you inspire me with this tribute style poem! Thanks for breathing life into my poem a day challenge. I will be checking both of you blogs tomorrow before I open my notebook! Write on! Thanks, Storykeeper and Melinda:>) I am constantly inspired by other people's blogs and books. Fun to pass that along! Your hard work, determination and generous spirit help me more than you'll ever know! Thanks for the great interview with Laura, Amy. As a knitter, of course, my mind went immediately to felted wool! Amy, your "Felt" poem is "F"antastic. one star for Carson City." And the ending stanza is perfect. Ah, state projects. My students are working together to produce an ABC book of Ohio History! Hooray for "Book Speak "! State reports are not my favorite, but I love the idea of felt states embroidered with this and that. Those kinds of state reports I could do! This post is chock-full of goodness! Thank you for it! I was looking around the internet for poetry resources I could use in my classroom for poetry month and happened upon your blog. Thank you for all the great ideas and the passion you share for poetry! Amy and Laura -- great poems, both! Amy, you really sealed it with your last stanza. Turns the poem from your experience into everyone's experience. I loved it. And Laura, you are really something else. I am going to try a "supply chain" poem on some topic or another. Maybe I'll write about the Madness and acknowledge the poets, the voters ... and the widget-makers! Also, I confess I agree with your editor on the last stanza. I can appreciate what "she" as the reader goes through where those lines would not necessarily apply to "me". Amy and Laura- you two are such wonderful teachers! I learn so much by reading your poems and your blogs! Now, I'm off to peek at Janet Wong's notebook! I'm very late reading, but so happy that I didn't miss you both. Bookspeak is a wonder-filled book. How could it not be-filled with poems about books and reading! Thank you Amy and Laura for such inspiration in the writing and such pleasure in the reading. What a gorgeous post, and so inspiring. I love the idea of this tribute poem, Laura, and Amy's ideas for students. Thank you both!